Of all the consequences of human-caused global warming, sea level rise has always held special alarm for me in its inexorability, its extension into the future, and the enormous disruption it threatens to centres of high population and essential infrastructure. Scientist Scott Mandia (blog) and writer Hunt Janin have teamed to produce for the general reader an explanation of what it will mean for the world in coming decades and beyond. 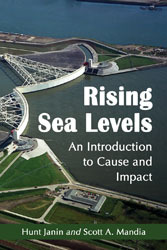 Their book Rising Sea Levels: An Introduction to Cause and Impact is patient and restrained in its survey, but no less sobering for that. Their coverage leaves no doubt as to the magnitude and extent of the measures that will have to be taken to try to cope with the effects of sea level rise as it gathers momentum and extent. The authors don’t expect much in the way of mitigation of climate change by international agreement to limit emissions. Indeed, they take it for granted that emissions are going to continue to rise and that international agreement will continue to founder on obdurate differences between political blocks which negotiators appear unable to resolve even in the face of such a threat as global warming. Presumably one day the common danger will become so overwhelming as to force international agreement, but the authors see no such early likelihood and certainly not in time to forestall metres of sea level rise. The book is not about preventing sea level rise but about preparing for it and adjusting to it. Decades of scientific research have shown that climate can change from both natural and anthropogenic causes. The Geology Faculty at WWU concur with rigorous, peer-reviewed assessments by the National Academies of Science (2005), the National Research Council (2006), and the Intergovernmental Panel on Climate Change (IPCC, 2007) that global climate has warmed significantly and that human activities (mainly greenhouse-gas emissions) account for most of the warming since the middle 1900s. If current trends continue, the projected increase in global temperature by the end of the twenty-first century will result in large impacts on humans and other species. Addressing the challenges posed by climate change will require a combination of adaptation to the changes that are likely to occur and global reductions of carbon dioxide emissions from anthropogenic sources. As Don Easterbrook has shown no signs of withdrawing his article claiming that most of the last 10,000 years were warmer than present, and as his university has shown no appetite for addressing the issue, Professor Scott Mandia of the Climate Science Rapid Response Team and I decided to write to the local press. The letter below was sent to The Bellingham Herald (local newspaper) and to Western Front Online (Western Washington University newspaper) on Monday January 9, 2011. Scott also called and left a message with the Bellingham Herald News Editor. He did not hear back from either newspaper, so we’re reprinting the letter in full here and at Scott’s blog. Don Easterbrook, a Professor Emeritus at Western Washington University has been promoting his belief that natural cycles of the sun and oceans are going to cause global cooling over the next few decades and this will offset the CO2-caused warming headed our way. In 2001, he announced that global cooling was about to begin and would last for the next 25 years. Of course, the previous decade was the warmest in over 150 years and 2010 is likely to be the warmest or second warmest year in that period. Easterbrook wants to persuade us to ignore global warming despite the fact that most of his peers, climate scientists, military and intelligence experts, health officials, and insurance companies expect major societal disruptions due to the current and expected human-caused climate disruption. It is ok to be wrong. Science cannot prove an idea is true but only that it is false. Correcting mistakes is how science moves forward. But Easterbrook is not just wrong, he is playing fast and loose with the data. He was caught red-handed using a doctored graph in a 2007 conference (see http://bit.ly/goEkd3) and in subsequent articles and talks. Easterbrook not only edited these graphics to change the information they contained, but did so in order to minimize the evidence of recent global warming. This is, at the very least, academic malpractice. More recently (12/28/10) he incorrectly labeled a graph of temperatures for the previous 10,000 years to claim that most of these years were warmer than present. His “current temperature” was really 1855 and not the much warmer present day. He was notified of his mistake but refuses to issue a retraction (see http://bit.ly/dW6BOk). A good scientist corrects and learns from mistakes, but this seems foreign to Easterbrook. WWU officials were notified of Easterbrook’s doctoring of data last May and again this January but have so far chosen to do nothing. Academic freedom must be cherished and defended but dishonesty should never be condoned – whether at WWU or any other institution of higher education. Bios: Scott Mandia is a professor of physical sciences at Suffolk County Community College, Long Island, New York and has been teaching meteorology and climatology courses for 23 years. Gareth Renowden is an NZ-based science writer and blogger, author of Hot Topic – Global Warming & The Future of New Zealand. He has written extensively on Easterbrook’s cavalier approach to climate data. I also note that you have publicly accused me of â€œfraudâ€, and have widely circulated that accusation on the internet, and have expressed the intention to invite the mass media to repeat it. Since this is a serious charge, do you have any evidence to back it up, or should I add your name to that of Professor Abraham in the libel case that will be filed shortly?